Lorain County Public Health gives people advice to help them control bed bug infestations. Bed bugs bite humans but do not spread disease. Prevent bed bugs - carefully check clothes and baggage, especially after traveling. Also inspect beds, sheets, blankets, and furniture for signs of bedbugs. Vacuum the mattress and bedroom floors often, and wash bedding often. Bed bugs are small, flat, insects that eat blood of people and animals. Bed bugs are reddish-brown in color and do not have wings. They range in size from a grain of sand to an apple seed, and they can live several months without eating. Bed bug infestations usually happen around or near the areas where people sleep, including couches and recliners. These areas include apartments, shelters, rooming houses, hotels, cruise ships, buses, trains, and dorm rooms. They hide during the day in places like seams of mattresses, box springs, bed frames, headboards, dresser tables, inside cracks or crevices, behind wallpaper, or any in other clutter or objects around a bed. Bed bugs can travel over 100 feet in a night, but tend to live within 8 feet of where people sleep. Bed bugs do not spread disease. Bed bugs can be annoying because their bites might make you itch. Sometimes itching the bites too much can cause a skin infection. How might bed bugs affect my health? A bed bug bite affects each person differently. Some people have no sign of a bite, some get a small bite mark, and some have a serious allergic reaction. Bed bugs are not considered dangerous. If you have an allergic reaction to several bites, you may need medical attention. 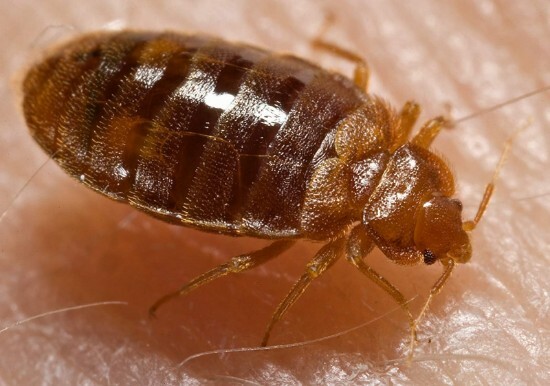 People sometimes spread bed bugs when they travel. They may not realize they’re spreading bed bugs because bed bugs are very good at hiding. To treat bites, avoid scratching the area and apply antiseptic creams or lotions and take an antihistamine. If you suspect that you have an infestation, contact your landlord or a professional pest control company that is experienced with treating bed bugs. The best way to prevent bed bugs is inspect for the signs of an infestation often. For advice on locating or treating bed bugs, contact LCPH at 440-322-6367.